Meet our 2013 Chrysler 300 Sedan proudly displayed in an incredible Gloss Black finish. Powered by a Pentastar 3.6 Liter V6 that offers 292hp while tethered to a fun to drive 8 Speed Automatic transmission that is changing the way the power meets the pavement. This elite Rear Wheel Drive combination yields near 31mpg on the open road and is just as fun to look at with beautiful alloy wheels, projector beam headlights, and bright exhaust tips. Inside our 300, see some extra lavishness waiting for you like our huge 8.4-inch touchscreen Uconnect media system that offers a powerful six-speaker sound system, Bluetooth connectivity with steering wheel controls for safer driving, and even a smarter dual-zone climate controller with a humidity sensor to balance out the outside climate. As the Flagship, Chrysler doesn't hold back on the safety that you demand with reactive head restraints, bountiful airbags for front/side/knee, four-wheel ABS, and even speed activated power locks for added security in today's world. Owning a beautiful car like this will make you smile a little more on the way to work and make you daydream about leaving work a little early just to enjoy the road. Turn this dream into reality. Print this page and call us Now... We Know You Will Enjoy Your Test Drive Towards Ownership! Now with 2 Locations in Lawrence! Please call, text or email to confirm location and availability of vehicles. Advertised price does not include any dealer fees and/or applicable tax. 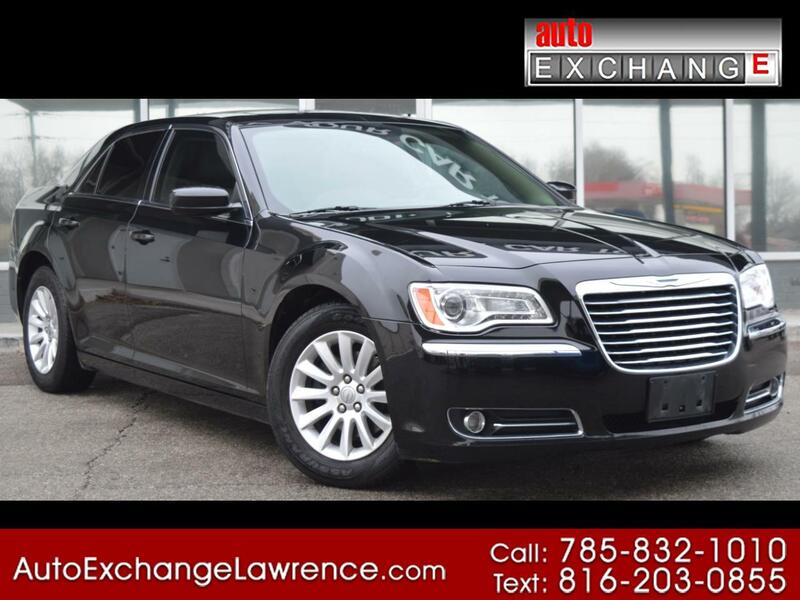 At Auto Exchange we have researched the market in order to provide our customers the most competitively priced used vehicles in Lawrence, Kansas City, Topeka and the surrounding areas. We take the hassle out of purchasing a QUALITY USED VEHICLES. Se Habla Espanol! We offer financing for customers with bad credit looking to rebuild or customers that have excellent credit with rates as low as 2.99% APR for qualified customers , vehicles and terms. With our finance options we have auto loans and leases for every budget and credit score. Call text or email our staff anytime for more information and look for our website at http://www.autoexchangelawrence.com . Vehicle leasing available. 20% down due at lease signing, $0 security deposit. Tax, Title and fees extra. Term of lease dependent on vehicle age and miles. Please call to verify miles because our cars are test driven every day. Thank you and we look forward to having you join our family! Listed price of all vehicles does not include Auto Exchange Documentation Fee and/or sales tax when applicable. Freight charges may apply when transporting vehicles from out side of Lawrence KS locations. *Advertised price does not include any dealers fees (included but not limited to $599 administrative fee and $199 preparation fee) and/or any applicable tax. All prices and offers are before state, city and/or county tax, tag, title and license fees. Out of state buyers are responsible for all state, county, city taxes and fees as well as title/registration fees in the state that the vehicle will be registered. Dealer not responsible for errors and omissions; all offers subject to change without notice, please confirm listings with dealer.